Containing a die shot of a Ryzen core. 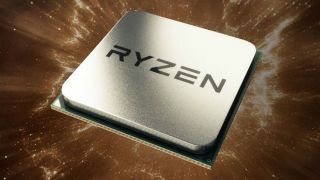 AMD brought some new information on its new Ryzen processors to the ISSCC (International Solid-State Circuits Conference) a couple of weeks ago, however a lot of it remained private. That is, until Japanese website PC Watch leaked some of the private slides which contain a whole range of details on the new architecture. Spotted by Hot Hardware, the new information reveals a shot of a Ryzen core, comprising a floating point unit and an integer engine. AMD is apparently switching things up from the Bulldozer architecture it has been using since 2011, which uses two integer engines and one floating point unit for each core. AMD has been talking about Neural Net Prediction, a technology which can increase performance and save processor time by taking an educated guess at what a branch in a program's code will do ahead of time. If the guess is correct, the code is executed faster. If it's wrong, there's a stall, but AMD's new branch predictor is constantly fed data to try and prevent these stalls. The slides also contain details about the differences between AMD and Intel's 14nm manufacturing process. PC Watch says "Intel is as small as 89 percent for CPP (Contacted Poly Pitch) with gate spacing and 81 percent for 1 x Metal Pitch showing wire spacing. In other words, the Intel process is more dense. Even for SRAM cell size, Intel is as small as 72 percent. Nevertheless, the cluster size of 4 CPU cores and 8MB L3 cache is as small as 44 mm2 for Intel's 49 mm2. Although there are reasons such as small floating point arithmetic units, it is also implied that AMD has lower design complexity." As we note in our full article about Ryzen's current details and expectations, AMD is finally going to be able to compete with Intel on the CPU stage again. Intel's superior process technology put the company in front for many years. With Ryzen, AMD is introducing simultaneous multi-threading, rather than clustered multi-threading, meaning that in multi-threaded applications, each core of the processor will execute two threads at the same time. As Hot Hardware points out, this design allows for the single large integer cluster, meaning higher single-threaded performance too. AMD says Ryzen processors should be 40 percent faster than the previous generation in terms of instructions per clock. Finally, AMD also mentioned Precision Boost, which is technology that's supposed to optimize performance by enacting on-the-fly frequency adjustments in small increments of 25MHz. It works with the Pure Power monitoring tech to determine whether the processor needs a boost in power, or can relax to keep temperature and voltage down. Right now, signs are pointing to a March 2 release date for Ryzen, and early pricing leaks indicate that AMD will indeed be competing with Intel at every level of performance.